This is all about the leadership succession, as Mr Mugabe's powers finally falter. The people who fought in the 1970s guerrilla war against white minority rule still dominate Zimbabwe's government and especially its security forces, and they are worried about losing that power and the wealth it generates. In his statement on Monday, Gen Chiwenga warned against the "purging, which is clearly targeting members of the party with a liberation background". This was obviously a reference to the sacking last week of Mr Mugabe's once loyal deputy, Mr Mnangagwa, a former defence minister, spy chief and veteran of the war of independence. He and Grace Mugabe, who is four decades younger than her husband, had been seen as the main candidates to succeed Mr Mugabe. Mrs Mugabe's supporters are known as Generation 40 or G40 - a name which signals a changing of the guard in Zimbabwe, at least partially, 37 years after independence. So this military action is the old guard reasserting its authority. 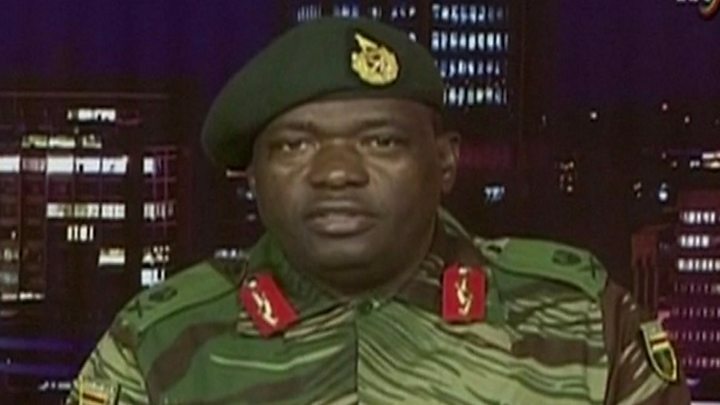 Mr Mugabe was the political leader of the guerrilla war so the army always professed loyalty to him until he explicitly came out in favour of his wife. The firing was coming from northern suburbs where Mr Mugabe and a number of government officials live, the BBC's Shingai Nyoka reports from Harare. "It's the end of a very painful and sad chapter in the history of a young nation, in which a dictator, as he became old, surrendered his court to a gang of thieves around his wife."